Ohio Bobcats senior linebacker Jacob Koons #46 participates in the team's pump-up cheer prior to the Bobcats' homecoming game against Central Michigan on October 7, 2017, in Athens, Ohio. Serena Williams of the United States argues with umpire Carlos Ramos during her Women's Singles finals match against Naomi Osaka of Japan on Day Thirteen of the 2018 US Open at the USTA Billie Jean King National Tennis Center on September 8, 2018 in the Flushing neighborhood of the Queens borough of New York City. 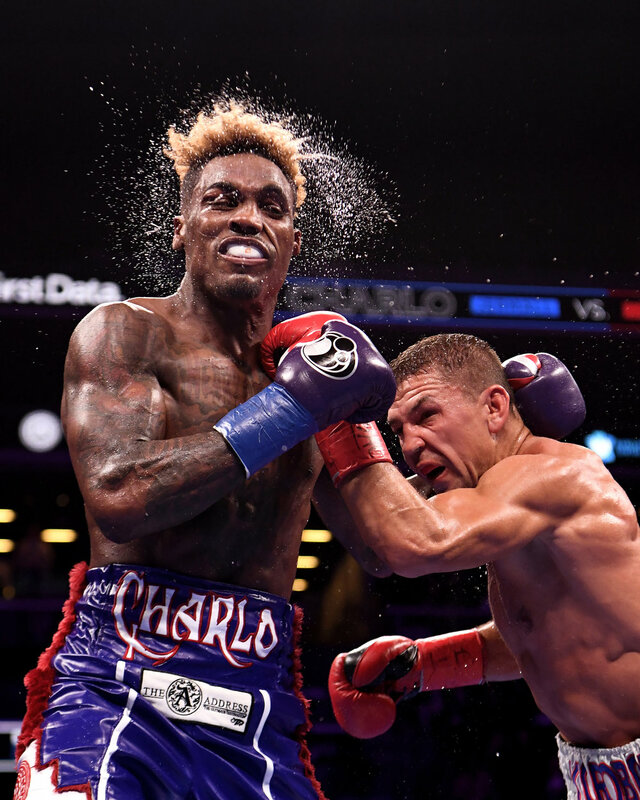 Matt Korobov punches Jermall Charlo during their WBC Interim Middleweight Championship bout at Barclays Center on December 22, 2018 in the Brooklyn borough of New York City. Jamal Adams #33 of the New York Jets takes the field before the game against the Green Bay Packers at MetLife Stadium on December 23, 2018 in East Rutherford, New Jersey. Sam Darnold #14 of the New York Jets passes against the Green Bay Packers during the first quarter at MetLife Stadium on December 23, 2018 in East Rutherford, New Jersey. Demetrius Andrade of the United States enters the ring for his WBO middleweight title fight against Artur Akavov at The Hulu Theater at Madison Square Garden on January 18, 2019 in New York City. RJ Barrett #5 of the Duke Blue Devils attempts a dunk during the first half of the game against Texas Tech Red Raiders during the Ameritas Insurance Classic at Madison Square Garden on December 20, 2018 in New York City. Joanne Calderwood of Scotland (R) fights against Ariane Lipski of Brazil during their Women's Flyweight fight at UFC Fight Night at Barclays Center on January 19, 2019 in New York City. NASCAR driver Kasey Kahne and his crew celebrate their win with a Mountain Dew shower at the Brickyard 400 at Indianapolis Motor Speedway on Sunday, July 23, 2017. Kahne's win came after a grueling race with a rain delay, a record 14 cautions and 7 lead changes. Connecticut Huskies head coach Dan Hurley reacts as the Connecticut Huskies bench celebrates after the Huskies rebound in the first half of the game against Syracuse Orange during the 2k Empire Classic at Madison Square Garden on November 15, 2018 in New York City. Ohio's Doug Taylor (45) puts it up for two points despite blocking attempts from Coppin State's Lucian Brownlee (L) and Karonn Davis (R). The 'Cats swept Coppin 79-37 on December 1, 2017, in Athens, Ohio. Runners of the Professional Men's Division lead the field during the 2018 TCS New York City Marathon on November 4, 2018 in New York City. Joe Harris #12 of the Brooklyn Nets attempts a layup against Jonas Valanciunas #17 of the Toronto Raptors during the game at Barclays Center on December 7, 2018 in the Brooklyn borough of New York City. Miles Reynolds #3 of the Oklahoma Sooners reacts during the second half of the game against Notre Dame Fighting Irish at Madison Square Garden on December 04, 2018 in New York City. Luke Voit #45 of the New York Yankees is hit by a pitch during the fifth inning of the game against the Baltimore Orioles during Opening Day at Yankee Stadium on March 28, 2019 in the Bronx borough of New York City.